The NCP® MultiMediaCard™ weighs less than two grams and, about the size of a postage stamp, is the world's smallest (24mm x 32mm x 1.4 mm) removable solid-state memory solutions for mobile applications, such as MP-3 music players, portable video games, laptop computers, personal digital assistants (PDA's), mobile telephones and digital cameras. MultiMediaCard™ uses ROM technology for read-only applications and Flash technology for read/write applications. The cards are fast for excellent system performance; energy efficient for prolonged battery life in portable products; and cost-efficient for use in systems sold at consumer price points. 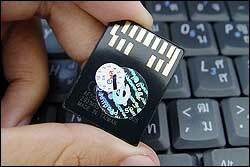 It is as if MultiMediaCard™ is made to measure for the fingernail-sized memory chip. Considerably smaller than a credit card, this innovative card can thus offer all the advantages of miniaturization. In the formats distributed by Hexon Media, NCP® MultiMediaCard™ dimensions are 32 mm x 24 mm x 1.4 mm. Floppy disks and CD's just cannot compete with this. The same applies to its suitability for everyday use. The usual problems, such as scratches, fingerprints, water, etc, will not impair the playback capability of NCP® MultiMediaCard™. As small as MultiMediaCard™ is, it demonstrates its true superiority when it comes to storing very large amounts of data. Because the card can also be stacked, several MultiMediaCard™ can be placed in a magazine and selectively addressed at any time. This is possible in a compact design within a very small place - an advantage which especially pays off for mobile applications. 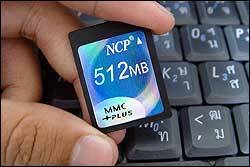 The NCP® MultiMediaCard™ combines the smallest format with an enormous memory capacity. It uses robust low cost packaging and support the stacking of up to 30 cards on a single bus. If all aspects of costs are taken into account, MultiMediaCard™ is the most inexpensive mass storage device for mobile applications. 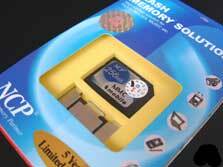 The 3D-technology alone sets new standards as regards to the cost of a chip. The moulding technology for the packaging is state-of-the-art and the serial interface ensures high reliability and, again, lower costs. Finally, there is the system technology: the playback units can be compact, need no moving parts, use less power, and have a multifunctional design suitable for multiple applications - at no additional cost. The advantages are many, the biggest one being the costs that beat competing solutions. NCP MMC Mobile solution deliver ample capacity and are energy efficient with the latest mobile phones, PDAs and other consumer electronic device. With Ultra fast data transfer speeds ( standard capable of up to 512MB/s) and unmatched versatility, NCP MMC Mobile cards are designed to maximize the performance of your multimedia enabled handset. Successors to the universally adapted RS-MMC ( Reduced Sized Multimedia Card) standard cards, NCP MMC Mobile offers 100% compatibility with new MMC Mobile and MMC plus devices, as well as backward compatibility with SD/MMC and RS-MMC devices. NCP MMC Mobile also offers Dual voltage capacity, allowing for compatibility with devices such as Nokia 6630 and 6680 smartphones requiring DV RS-MMC.